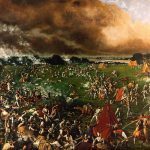 The background to the Texan Revolution is simple. Mexico had allowed American immigrants to settle in relatively remote and empty Texas. Preoccupied with its own revolution, the native population was soon outnumbered by the immigrants, many of whom were from the southern states, so they wanted to continue their practice of slavery even though it was illegal in Mexico. More important, this was the Age of Expansion. Americans were used to settling and absorbing an area, regardless of what the original population thought, so conflict was inevitable. After a series of confrontations, open warfare began in October 1835 and the rebels had gained control of Texas by early December. Believing that the Mexican government would not be able to respond until spring, attention shifted from building an army to debating whether or not to declare independence. This may seem to have been an unnecessary debate but revolutions are often not as unanimous as they later appear to be. Colonel William Travis has been ordered to hold the Alamo to buy time for Sam Houston to build an army, and he is in charge because the trauma of storming the Alamo had driven Jim Bowie to find peace in the bottom of a bottle. Colonel Davy Crockett shows up leading a group of jolly Tennesseans, and although they had come to hunt, Crockett convinces the Tennesseans to help defend the Alamo. Unfortunately, Santa Anna appears with a powerful army much sooner than expected, and the rebels prepare to fight off the Mexican army while hoping that reinforcements will arrive in time. 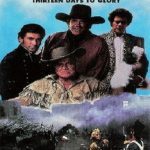 The story of how William Barrett Travis, Jim Bowie and Davy Crockett had led 182 men to hold off a Mexican army of five thousand men for thirteen days was familiar to American audiences, so the only background about the Texan Revolution is in the opening narration which admits that the rebels were Mexican citizens but Santa Anna was coming north to crush all who opposed his tyrannical rule. That’s it. The battle to capture the Alamo during the initial rebellion had been bloody but the real Bowie, like Houston, Travis and Stephen Austin, had left the siege considerably before the final assault on the Alamo. Moreover, Bowie was a heavy drinker who was popular because he was a respected fighter and he led huge parties. Travis only inherited command when Bowie was laid low by something, probably tuberculosis, right after the arrival of Santa Anna’s army. Actually, Houston had sent Bowie to take away the cannon and blow up the Alamo because he knew that the Mexican army would roll over any fort. Santa Anna stopped at the Alamo because he was ahead of schedule and he was waiting for his heavy artillery to catch up. Furthermore, Houston did not even believe that the Alamo was in danger, and the young Texan government was more pre-occupied debating whether or not to actually declare independence. Significant parts of the story are changed to make the rebels heroic. Crockett’s men comment that the Mexicans may have fancy uniforms but they just spent two years putting down revolts so they are fighting men. While seemingly giving credit to the enemy, Wayne obviously intended to conceal the fact that the rebels were beaten by an army largely made up of untrained conscripts. Also, Bowie loves his Mexican wife and two sons but in reality they did not have any children. Since his wife was not mentioned in his will, it seems doubtful that he was attracted to anything other than her money. Crockett’s fear of a Mexican invasion of the United States is laughable since Santa Anna’s greatest worry was that America would become involved. It seems likely that Wayne wanted the Tennesseans to be noble volunteers rather than poor men with few prospects who were willing to kill dark-skinned people in exchange for a land grant. The final assault begins when the whole Mexican army marches up, drums banging, in broad daylight. The actual final assault was a surprise dawn attack but Wayne presumably wanted to show that honorable men attack during the daytime. The Mexicans take horrendous casualties but even so the rebels die one by one. Viewers may wonder why the screen Santa Anna did not just use cannon instead of throwing away so many men. In fact, the real Santa Anna was jealous of the glory that his other commanders were gaining and wanted to take the Alamo through assault to put fear into the rest of the rebels. The huge casualties that would likely result did not matter in the least. Being a John Wayne film, he gets to beat up a lot of men, win the love of a charming, young Hispanic woman, and foil the plans of a slimy Anglo who is cutting deals with Santa Anna. This is not a bad thing since this is what Wayne was best suited for and there is some good humor in the courtship scene. 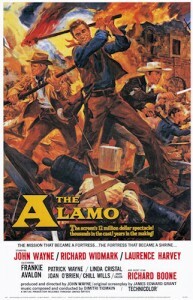 Wayne’s insistence on choosing the Alamo to be his first film as a director meant that the studio was unwilling to pay more than a portion of the budget, which was so huge that even with the substantial assistance of private investors, he had to mortgage everything he owned to make this film. I mention this to present Wayne’s intense feelings for the film, which was made at the height of the Cold War, and was intended to show that Americans would fight to the death to defend democracy. It is also widely believed to make up for refusing to serve his country in WWII in order to focus on his burgeoning career. Much of the movie focuses on the three main characters’ contrasting leadership styles. Travis believes that the best way to handle troops is to lie to them, while Bowie is unable to see the big picture. It is Wayne’s movie so Crockett is the ideal leader, who reasons calmly with Travis and handles Bowie by getting him drunk. Another theme is the conflict between regular and irregular troops. Unable to speak other than with clipped words, Travis’ belief in iron discipline repels the free-spirited Crockett and Bowie. At first, Bowie and Crockett do not consult with Travis when they raid the enemy but the three leaders learn to respect each other and realize the need for regulars and irregulars to cooperate. With any movie about the Alamo, the key question is why did they stay? In this version, Travis believes that by the time Santa Anna’s full army arrives, reinforcements will come from Goliad, the nearest rebel fort. When they do not appear in time Travis makes a stirring speech that persuades everyone to stay. In reality, the defenders did not have any choice since the Mexicans had already surrounded the Alamo. Wayne has been repeatedly criticized for his limited directing ability. Many people have felt that John Ford, Wayne’s mentor, was the uncredited director because he had showed up early in the shooting. While there is little debate that the film could have benefited from Ford’s touch, when he started to tell Wayne how to direct, he was sent off for several weeks to film second unit footage that was not used, so for better or worse it was Wayne’s movie. Admittedly, the Alamo does not stand up with the work that Wayne did with Ford, but then again what does? Some beautiful work with shadows proves that William Clothier was one of the best cinematographers of the time. The massive budget was worth it and it is a pleasure to see Santa Anna’s huge army back in the day of casts of thousands. Designed for both interior and exterior scenes, the set gives the film a very realistic feeling. While even Wayne’s friends admit that he did not know how to direct actors, few scenes drag, mainly the overlong speeches. Also, the stagy and preachy dialogue does not seem natural. Furthermore, Wayne’s movies were usually limited by his preference for directors like Andrew McLaglen, who were competent but easily dominated, so this film is smoother because he could not dominate himself. In fact, he was so busy starring, directing and producing that the supporting characters were given a great deal of screen time. It stretches the facts horribly and there is a bit more adventure than is plausible but it is a good movie. You covered all the bases and relevant point, as usual. All the more reason to hate John Wayne. Nice review Andrew, thank youl. The more I read about Wayne, the more I dislike him, but I find his screen persona oddly comforting, especially the films he made with John Ford. Glad you liked the review and I appreciate your feedback, as always. I f***ing hate liberal movie reviewers, the guy who wrote this is a real snowflake. How I would love to transport this P.O.S. to Texas in 1836 and see how he does. Thanks for the feedback, writing is lonely work, so any feedback, even negative, is appreciated. However, your criticism would be more effective if you actually said what you think is wrong with the review.